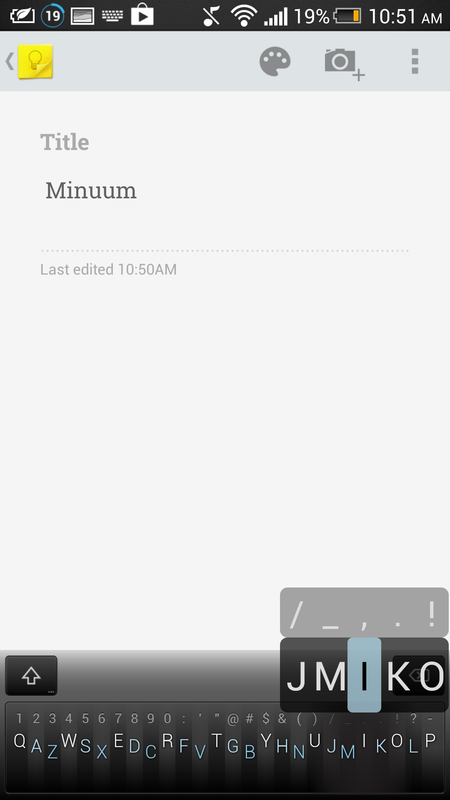 Months of waiting, teased and previewed, have paid off for impatient Minuum backers, as the one-dimensional keyboard replacement for Android is finally here. 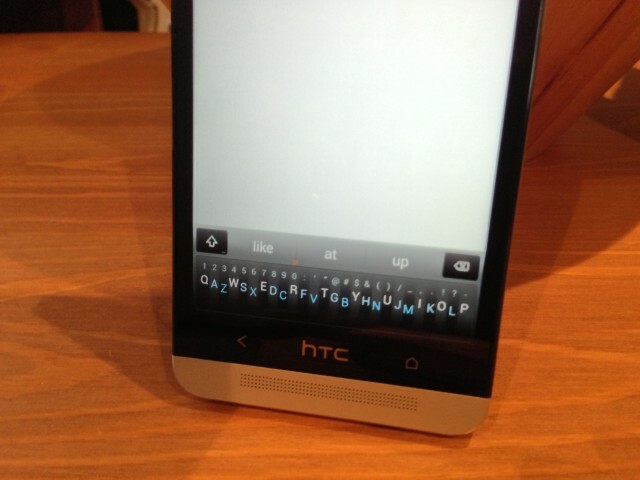 The upside is simple: this keyboard is small, more so than SwiftKey, Swype or Fleksy. 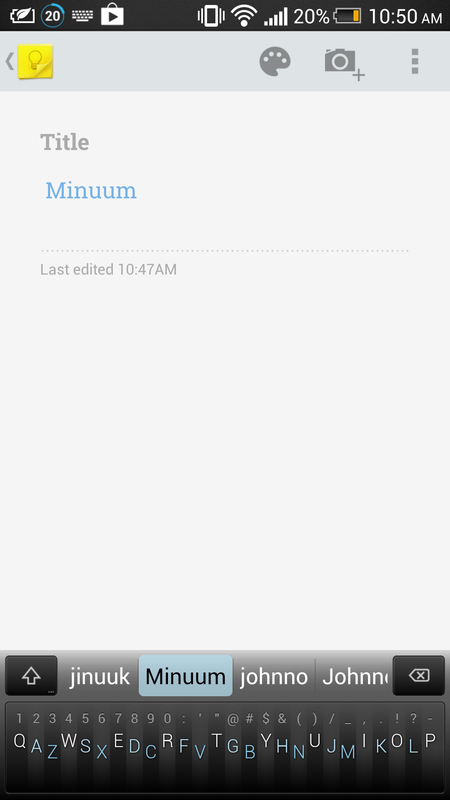 By default, Minuum takes up a paltry 240 pixels, though that can be adjusted down to 160 pixels if you’re so inclined. 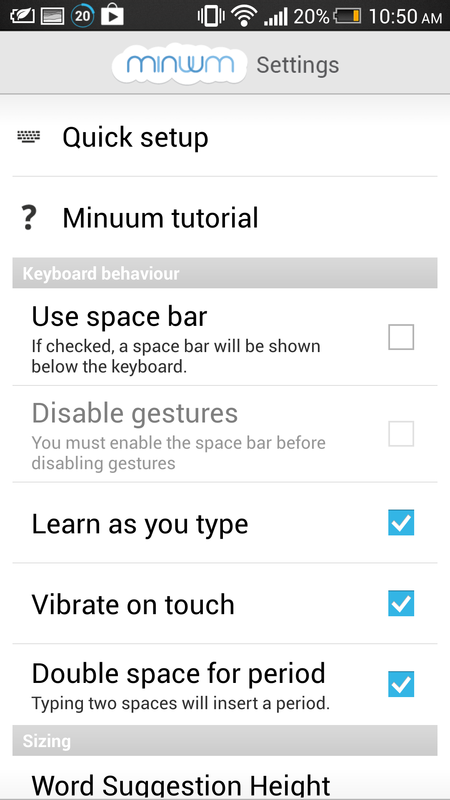 Minuum is also incredibly accurate, but not because you’re placing your fingers in the right spots on the keyboard. No, that would be impossible. It’s Whirlscape’s — the creator of Minuum, lead by Toronto’s Will Walmsley — autocorrect algorithm that predicts what you were trying to say with eery accuracy. Minuum knows what you’re trying to type, and if it doesn’t recognize the word its easy-enough manual typing system — hold down on an area and swipe up to reveal a magnified view of the surrounding letters — lets you more accurately enter proper nouns, names and passwords. The keyboard can also import your address book details, so you won’t have to force its dictionary to relearn impossible-to-pronounce surnames. As you can see from the example above, I typed in “jinuuk” and received the correction “Minuum,” which is exactly what I wanted to type. Moving between words requires a gesture to the right for a space, or one to the left to delete an entire word. The backspace key at the top right of the suggestion box lets you delete individual words. Above the magnified letters are punctuation, which can also be accessed by flicking down on the keyboard to change to the numbers/symbols format. To jump down a line, make like you’re entering a space and move your finger up slightly, forming an upside down “L” shape. Move your thumb far enough in one direction and you’ll enable a hot menu, with four toucn points that let you perform a variety of functions, or enter the settings. Basically, you’ll have to get used to it. But how well does it work as a keyboard? And why, in this age of five-inch Android devices, would you want to save those extra few pixels? Really, there isn’t an answer to that: Minuum isn’t necessarily better than the stock Android keyboard, nor does it predict more accurately than SwiftKey or Swype. It does show more of the screen as you’re typing, so those longer emails or status updates can be seen on more of the display. More importantly, though, Minuum is a wonderful, effervescent technology demo, a product that outlines the future of text input on surfaces other than touchscreens. 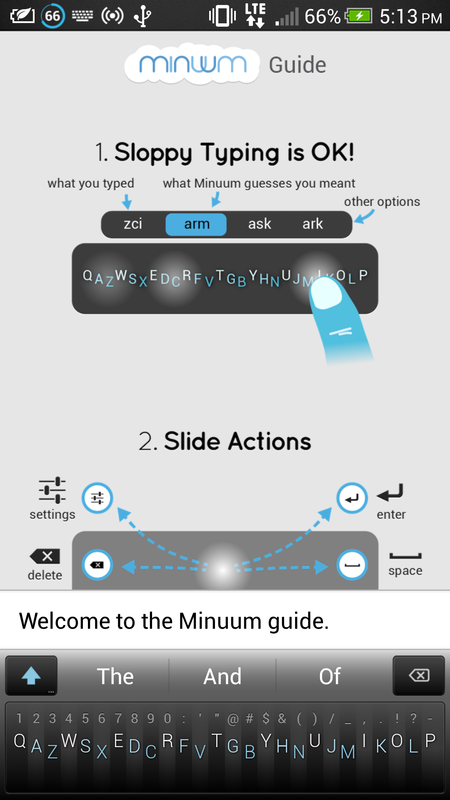 You can type quickly with Minuum once you get the hang of it, and I’m certainly going to give it my best shot, but I see it working better for entry-level products, the ones with low-resolution 3-inch displays that don’t have a pixel to spare. I see it paired with a smart watch or a Google Glass product, where text input is not currently possible in a meaningful way. Minuum is worth using, and if you paid for access via Indiegogo, you should be receiving a personalized email in the next day or so asking you join its Google Group to gain access to a download link. It may not replace your full-time keyboard, but it’s one of those apps you have to boast to your friends about, and something that still differentiates Android from iOS and Windows Phone.